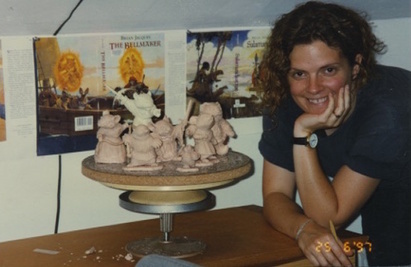 Limited editions of 800 each character --- we want to thank our Redwallians whom, over the years, have found our studio website and ordered these beloved rare pieces by American Artist, Julie London. Please use the "Contact Merna" page to inquire of availability and cost of any of the sculptures seen below (some are sold out). This page was updated on September 19. 2018. 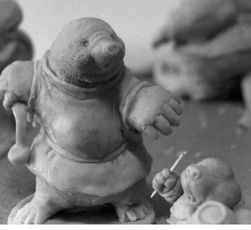 N'uncle Grumm and nephew Bungo in London's original clay form at the studio before they went to mold making, casting, and painting. In 2006 at the Pleasanton Library in California, author Brian Jacques posed with Merna Chance and the #800/800 Limited Edition of Martin the Warrior. Brian hand signed Martin's box for Merna. She saw Brian Jacques just one more time after this appearance, in Berkeley, CA. 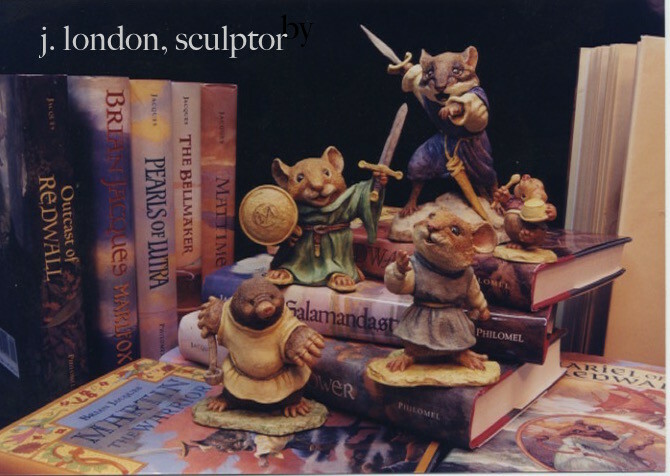 Redwall Sculptures produced by permission of the Redwall Abbey Company LTD, and Random House Children's Books, UK. Bingo produced by permission of Penguin Putnam, NY and Christopher Denise. Redwall Sketch used by permission of Troy Howell. Sculpture Copyright of Julie London, 1997 • Offered by Merna Chance, London's Studio Associate • All rights reserved.